Kellie has been fortunate to be a speaker at several book clubs on the East Coast. From these events is a compilation of frequently asked questions about A GUILTY MIND. (Please note some questions could be a spoiler alert). If you have a question you’d like to see answered, please use the contact page to submit! Are the locations, George’s river house, and the doctor’s office based on a specific house or building? Neither is. Having lived in D.C., I would often walk by “row house” type offices and I always loved the history and charm they represented. But since D.C. is a busy city, I also wondered about the security of some of those places. This is one of the reasons I used the lack of substantial security in Dr. Michael’s building as an impediment in Cancini’s investigation. I also used that type of building because it seemed fitting to the doctor’s personality. George’s river house is based partially on a house where I attended a wedding and partly on the many river homes we have here in central Virginia. Many families that own river houses here pass them down just as George’s father did. Mary Helen is a unique character. Is she based on anyone in particular? This is probably one of the questions I am asked most. Mary Helen is not based on anyone in particular but she is based on a composite of many women I have met or encountered. To me, she is a complete contradiction. She feels “entitled” and no one has ever dared to let her think otherwise. Yet, she does possess a deep capacity to love as evidenced by her devotion to her children. She is miserable in her marriage but cannot be seen as a failure in her privileged world. It is preferable to stay married than get divorced which she considers low-class. When George’s confessions are revealed, however, divorce suddenly seems like a good idea. Ironically, she does love George. George is such a beaten man. (Spoiler Alert) It bothers me that he ends up being punished for a crime he didn’t commit. Almost every reader I’ve spoken with has had some kind of reaction to the ending of the book. I knew even as I wrote it that it wasn’t the happy ending some would like to see. It wasn’t even the happy ending I wanted to see. I adore George and I don’t know if I’ll ever write another character that touches me in quite the same way that he did. Still, his “confession” and ultimate penance were in character. I believe that while it wasn’t a “feel-good” ending, it was the only ending possible. Why does Cancini, who is so interested in justice, let him do it? When I wrote the book, I struggled with Cancini’s role in George’s sentencing. The detective knew George did not kill Dr. Michael and yet he let him confess. This seems legally wrong but he did it for several reasons. The real killer, George’s daughter, was a sick woman. She was a damaged soul and he understood that her biological parents blamed themselves for her illness. While Cancini might not agree with that entirely, he recognized that George desperately needed to take responsibility for the pain he had caused in his life. He also knew that any case he made against Lauren was going to be compromised by George’s confession. He had no doubt that George was not acting impulsively. If he fought it, both parties might go free and Lauren would never get the psychiatric help she needed. I also wanted to show that Cancini had grown through this investigation. He’d learned that what sometimes seemed black and white was not as clear as he’d once believed. His view of right and wrong had been borne out of the loss and brutal slaying of his mother. He had a burning desire to find justice. In the case of Dr. Michael’s murder, Sarah’s “accidental death”, and George’s confession, he realized that justice sometimes comes in unexpected ways. I like Detective Cancini. Will we see him again? Absolutely. 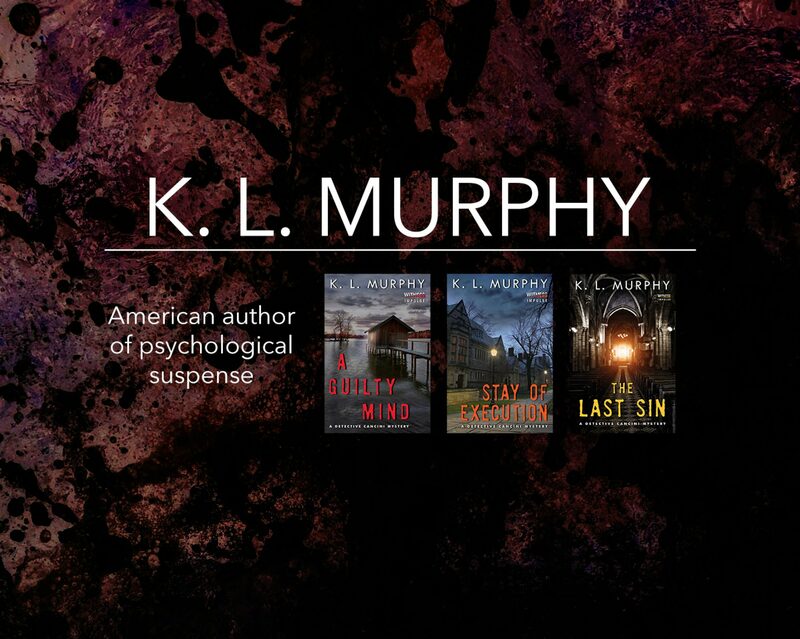 He is at the heart of STAY OF EXECUTION where he is pulled back into a decades-old investigation. A man he’d once put away for a series of rapes and murders on a college campus is suddenly declared innocent based on new DNA evidence. When that man returns to the college town, a new rash of rapes and murders sets off a new investigation. Cancini is drawn back to both cases, the old and the new. Will we see George again? Unfortunately, no. I do get this question quite a bit and I take this as a compliment. To me, this means that other readers felt an emotional attachment to George just as I do. I wish I could bring him back but, considering how A GUILTY MIND ended, that just wouldn’t make sense to me. When can we expect to see your next book? He’s back. Cancini is back, there are some new characters I’ve had a lot of fun writing, too. I can’t wait for everyone to read it!